Here's Senor Cobas stood with his Flying Brick and this is the look I'm aiming for. 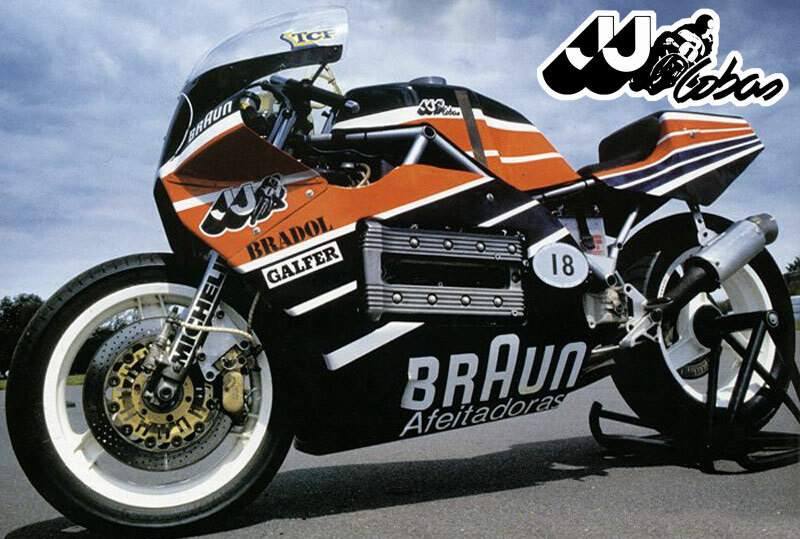 In the spirit of JJ's bike,it's an 8 valver. Modified oil /water pump.......and the list goes on! That's about up to date now. 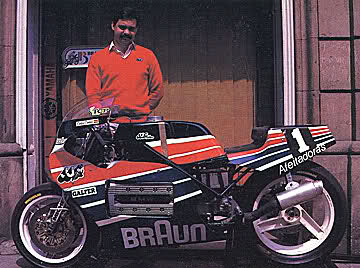 There's also the handling department but that's for another time! I can see myself doing something like that in my little tin shed! Any millionaires out there who could flick me a lazy 20 grand to see my dream fulfilled? "Modified oil /water pump"...any details about this mod that you can pass on to us? Looking great so far, the white wheels look real sharp. It's got modified gearing to flow more fluids. It's not back with me yet so I've not examined the mods. As the bike is going to spend a lot of time getting ridden hard,I'm advised this is the way to go. More details when I have them. It's untidy at the moment as I'm in "construction" mode. I've also just sold a few bikes to thin the herd out a little-I had too many and wanted some floor space back. 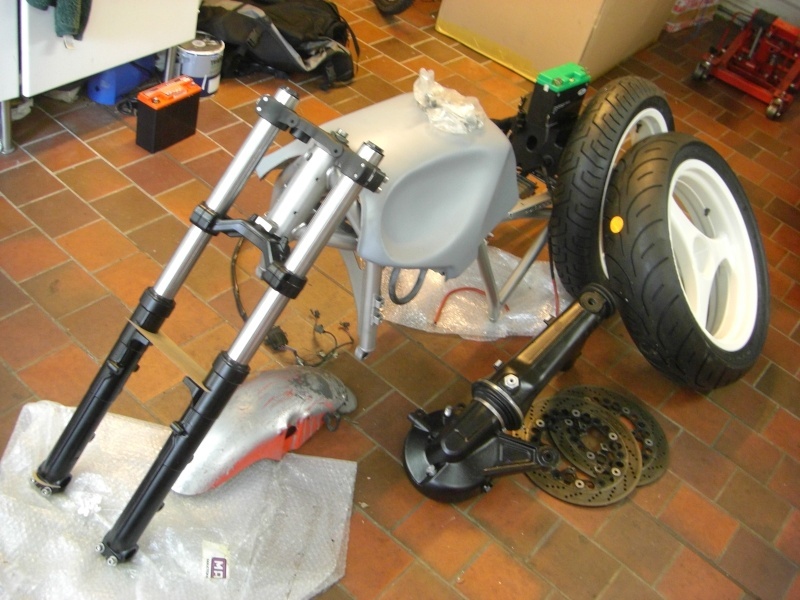 On the strength of building the Brick,I've just sold my lovely 927cc shortstroke Airhead track bike. 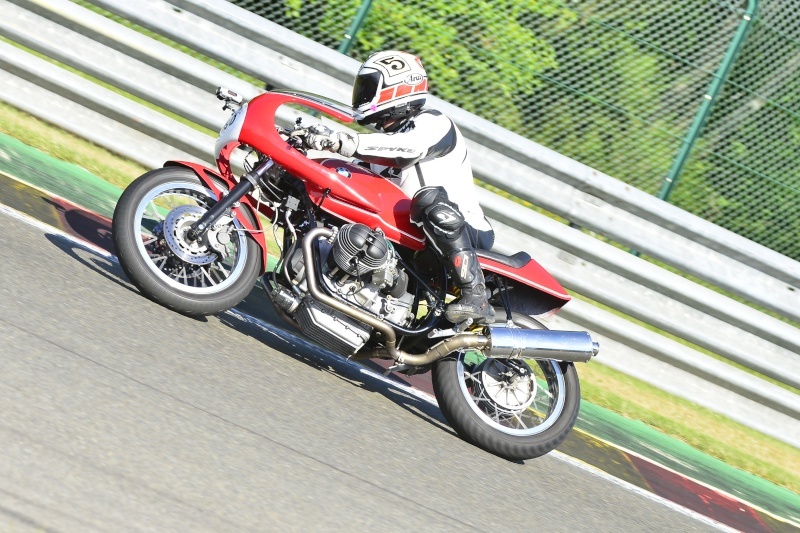 A decision I hope I won't regret but I do have a little "sellers remorse"
The Bikers Classic at Spa last year. 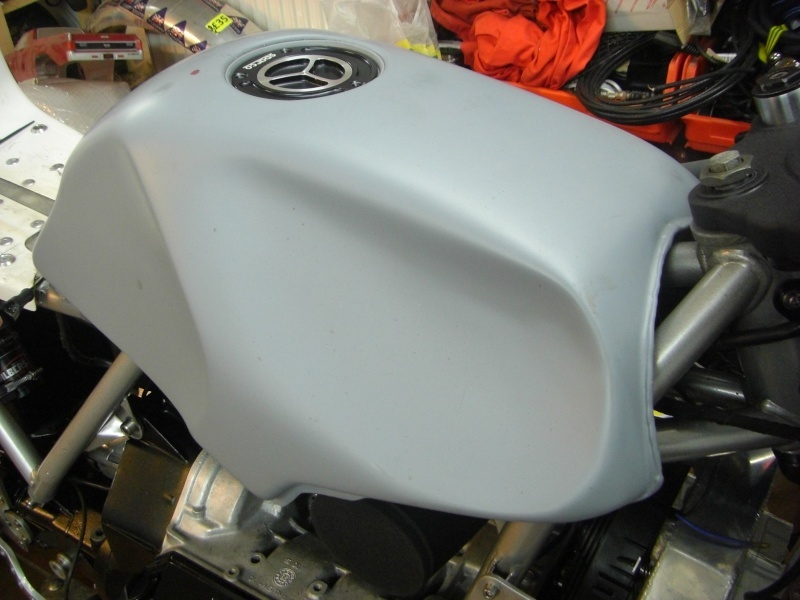 I'm considering welding some alloy sheet to the fuel tank at the front to finish the lines as the stock tank is an awkward shape when it's exposed. 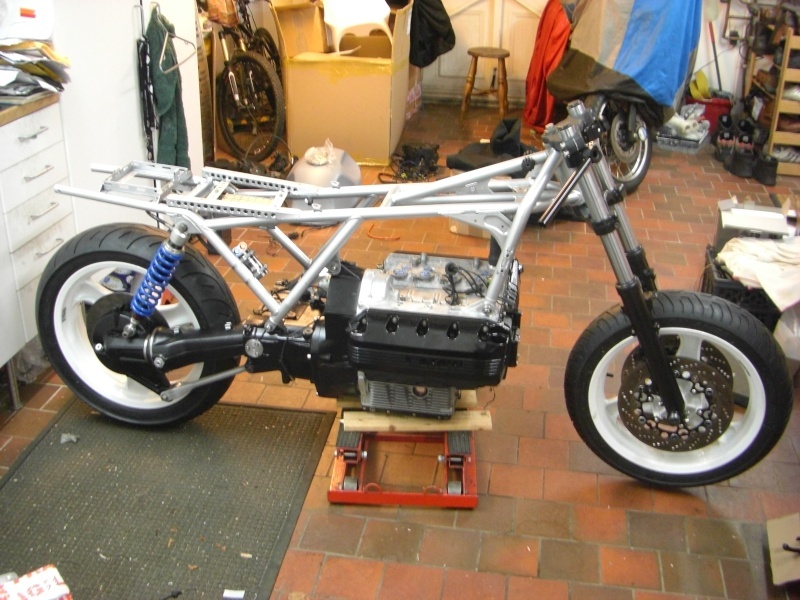 That's really ugly down there and I can't leave it after all the effort put into the rest of the bike. Here is the top triple clamp and instruments. 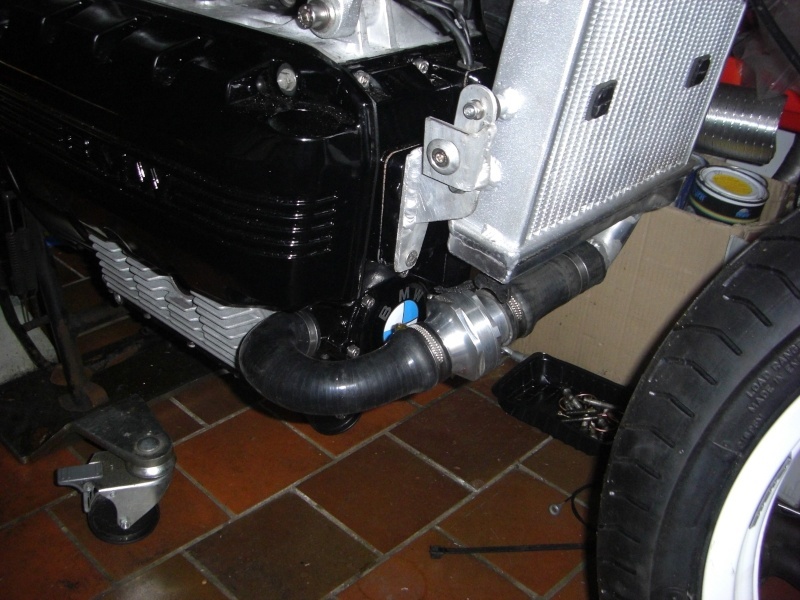 Narrow 2 row rad fitted with modified waterpump. It had to be narrow to fit inside the fairing. 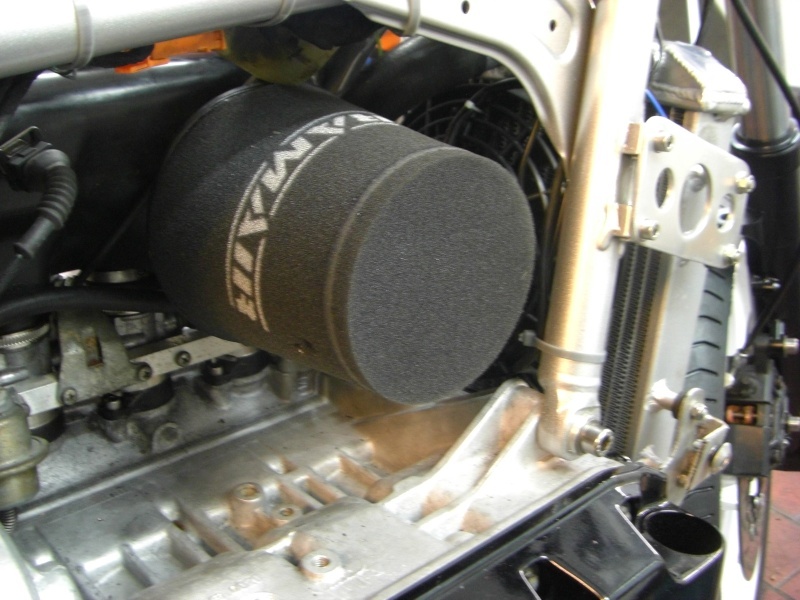 The huge airfilter is only temporary as some trick throttle bodies are under construction. When they arrive,another filter will no doubt have to be sorted......and before anyone mentions that it's behind the warm air coming from the radiator,it will have ducting for a cool air supply! This looks like a pretty well thought out design. Two thing I noticed immediately. 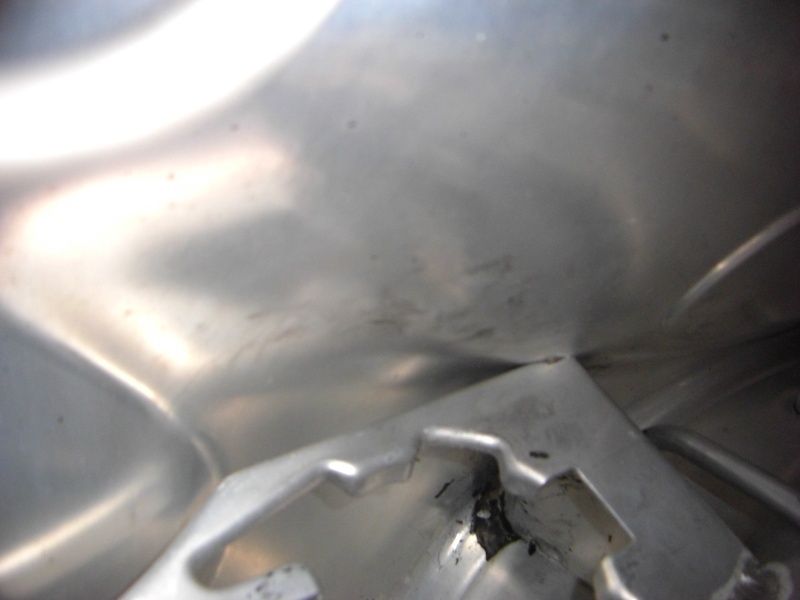 You trimmed off the tabs for the side covers from the bottom of the tank. It is a pet hate of mine that people go to all the trouble of removing any trace of the fairing yet leave that big flap with a hole in it. 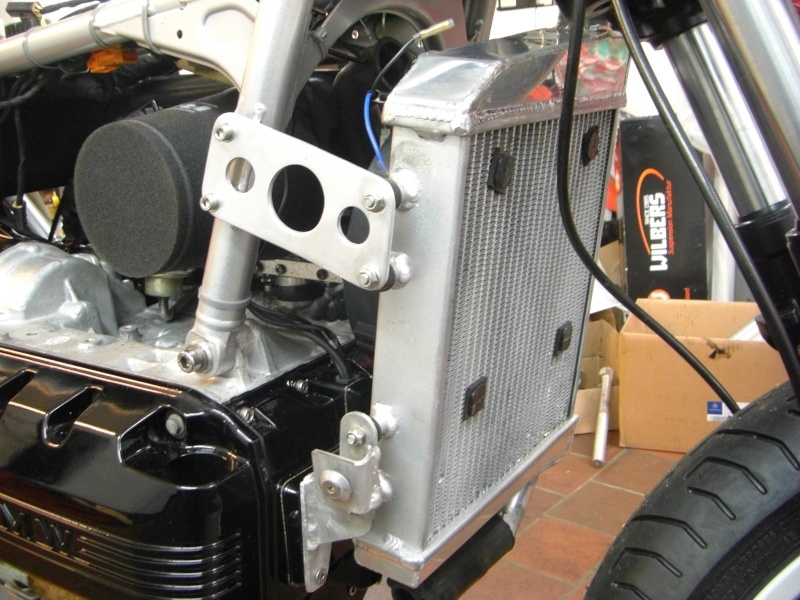 You have used the fairing mounts on the frame to hold the radiator. Brilliant. Another pet hate. Is that a non-stock tank? I am noticing the large indent on the side and no circle for the emblem. @rosskko wrote: This looks like a pretty well thought out design. I agree about the tabs on the tank but perhaps people are afraid to cut them off in case they make the tank leak? If you're careful it's an easy job. 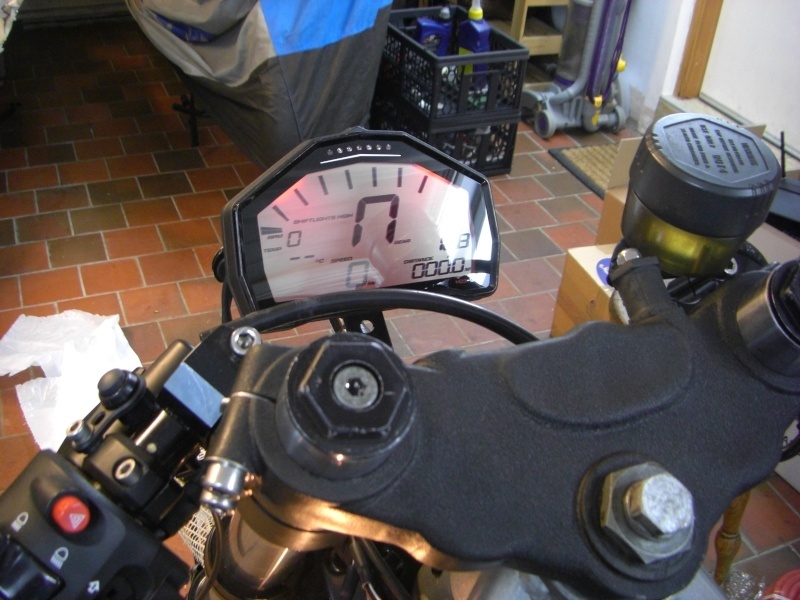 As for using the fairing mounts,I think it's a bit of luck that the rad mounts were in just the right place this time. 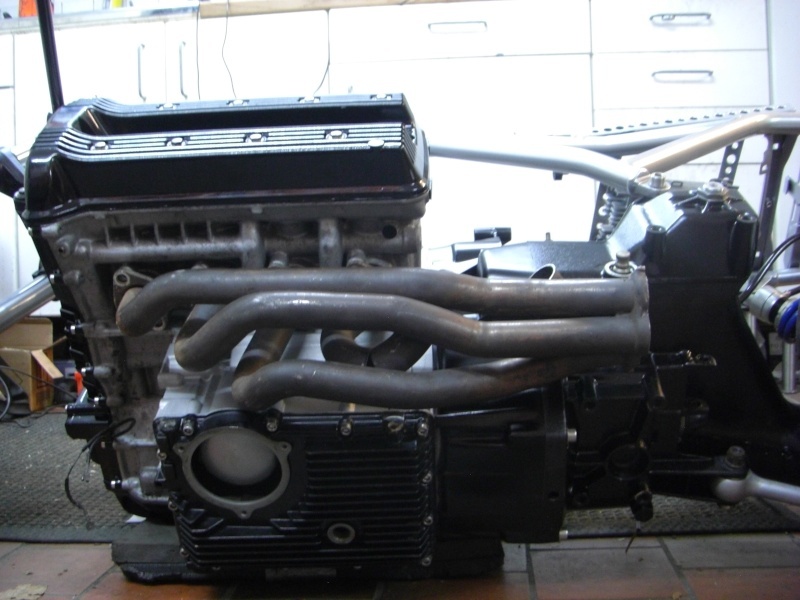 It's off for a set of 38mm headers next week and when it comes back I'll be very close to pressing the button to see if it runs. Fingers crossed! 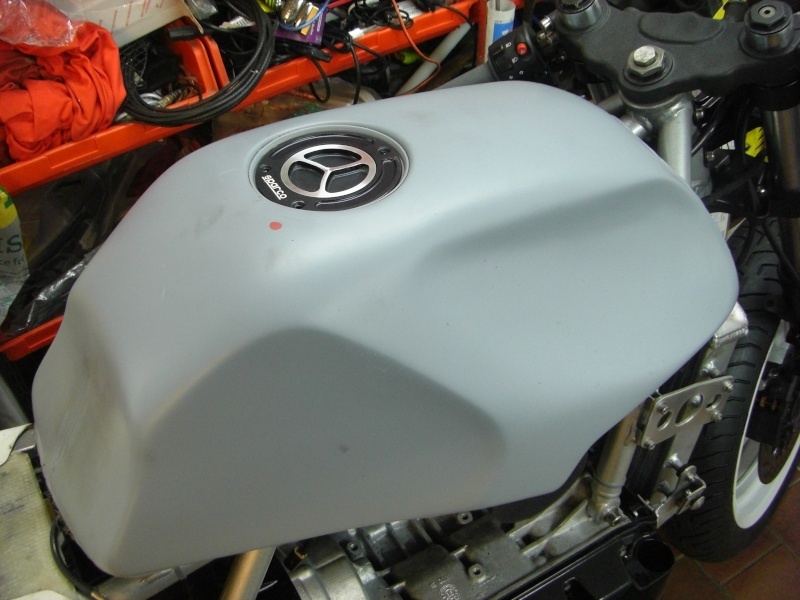 @KafeRacer wrote: Is that a non-stock tank? I am noticing the large indent on the side and no circle for the emblem. 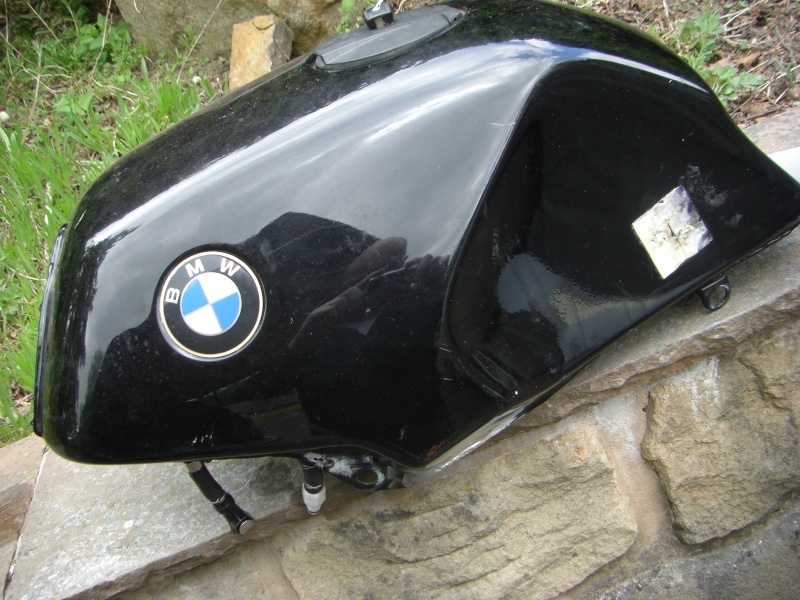 It's a genuine BMW alloy tank lovingly re-crafted in my shed. Here are some better pictures for you. Will you have a go? Well that looks like excellent job on the tank. Now I notice the gas cap, something you crafted/modified as well? @KafeRacer wrote: Well that looks like excellent job on the tank. Now I notice the gas cap, something you crafted/modified as well? 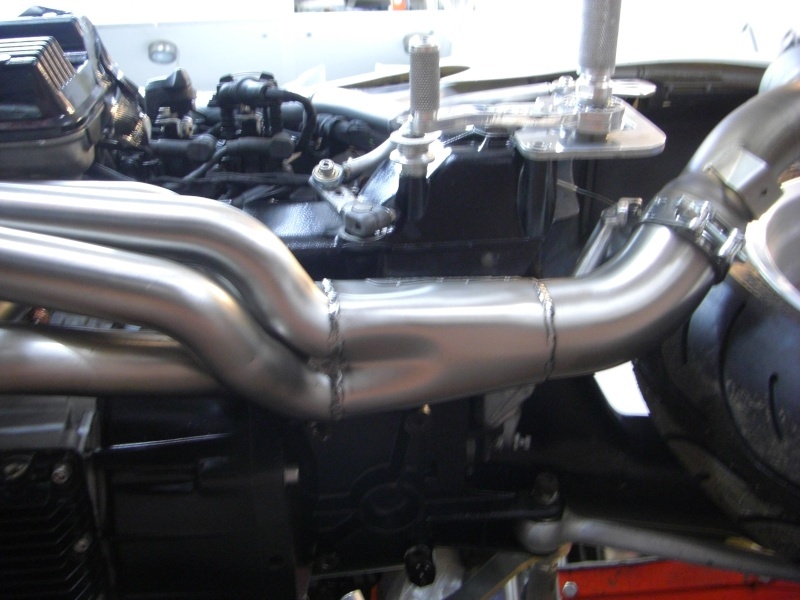 I've got to weld 3 small tabs onto the inside lip,drill and tap them and fit the new billet cap with a gasket. The stock fitment cap is waaay to big. 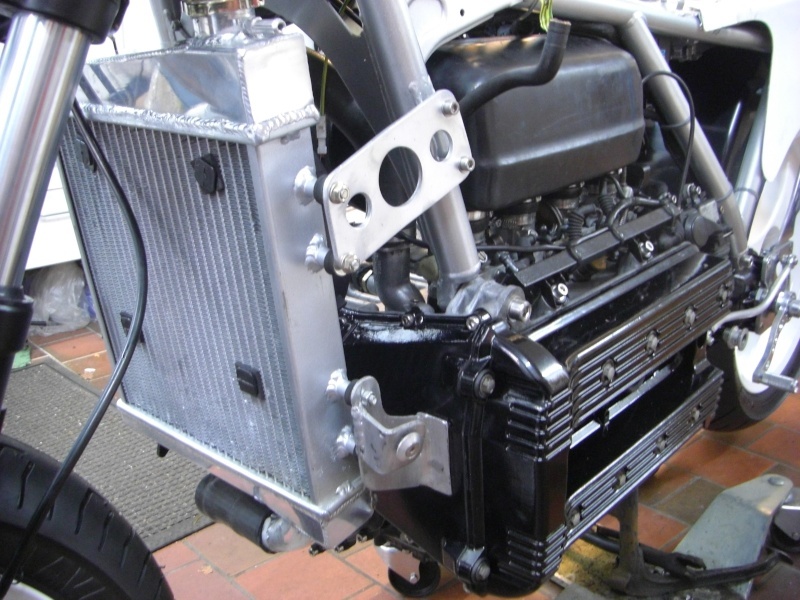 The radiator is now all plumbed in. 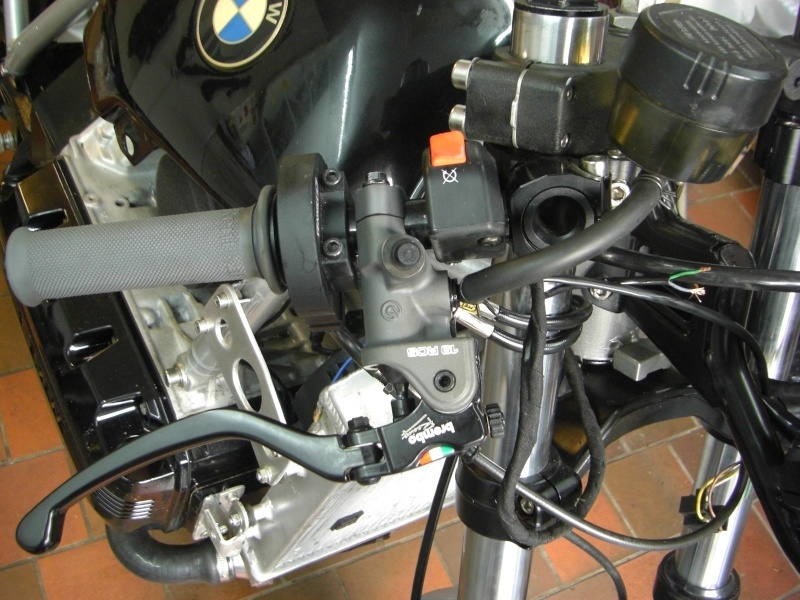 As most of you on here will know, the stock BMW rad has an integral thermostat fitted. 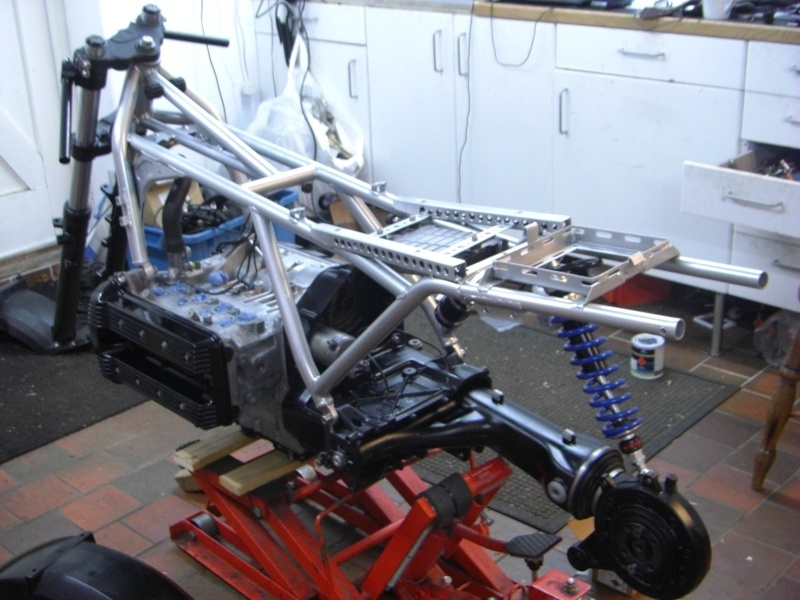 I thought it unwise to run without a stat so found an all alloy in line car housing, it's huge but should do the job nicely. 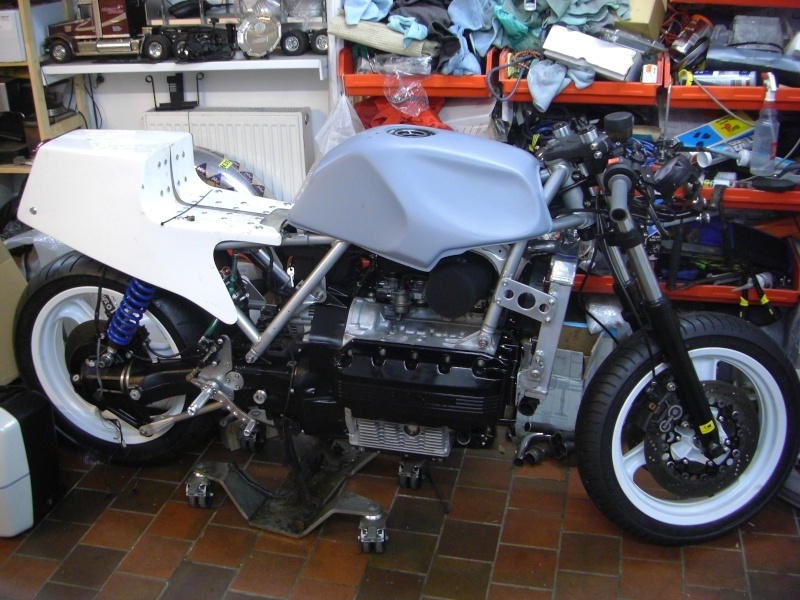 Interesting routing for the coolant hoses.....The bike looks a great job! 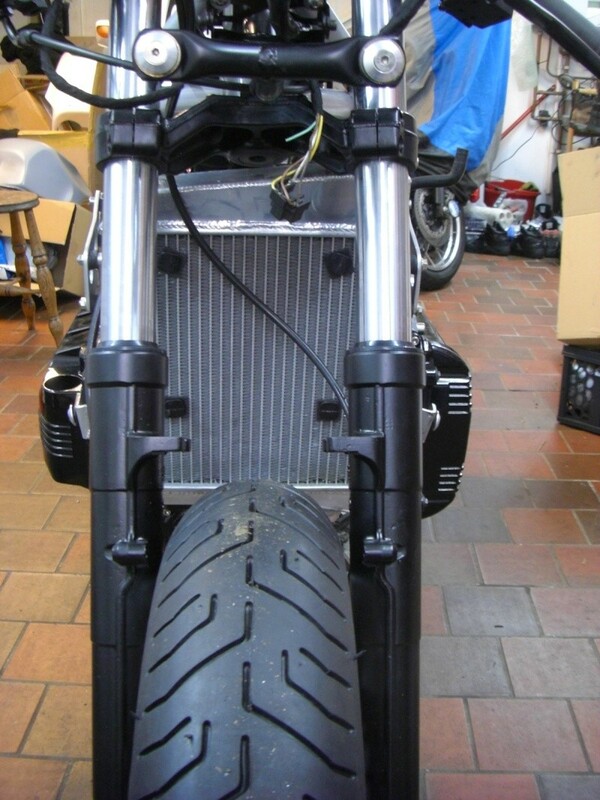 @92KK 84WW Olaf wrote: Interesting routing for the coolant hoses.....The bike looks a great job! Interesting routing and necessary (though not ideal!) as I couldn't think of another way to get the stat in line. I love the attention to detail, the water/oil pump cover too. At the weekend we had a meet up and funny we had a discussion about thermostats at one point. 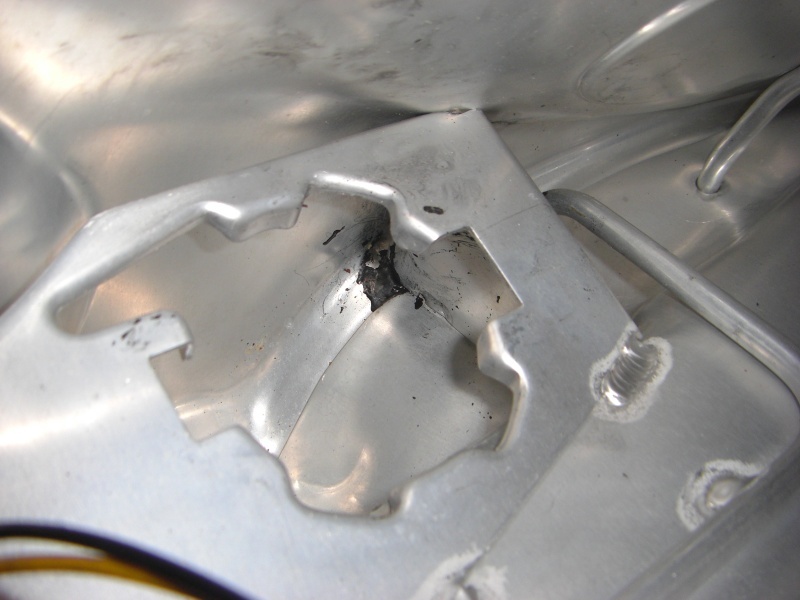 But the thought about thermostats was they really only kicked in when the engine was fired up first, or when you were driving in extreme cold conditions and needed to avoid overcooling the engine. I wonder in very warm conditions does the thermostat simply stay fully open when the engine is warmed up? 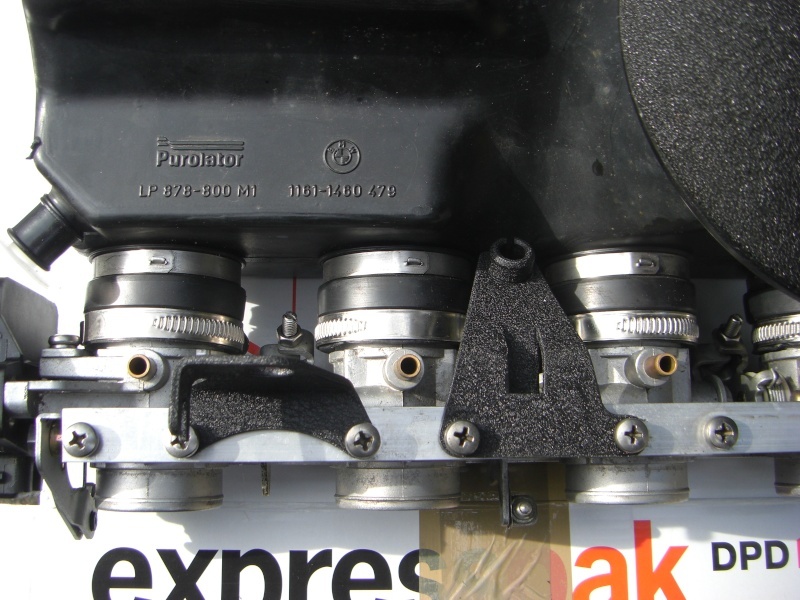 @92KK 84WW Olaf wrote: I love the attention to detail, the water/oil pump cover too. 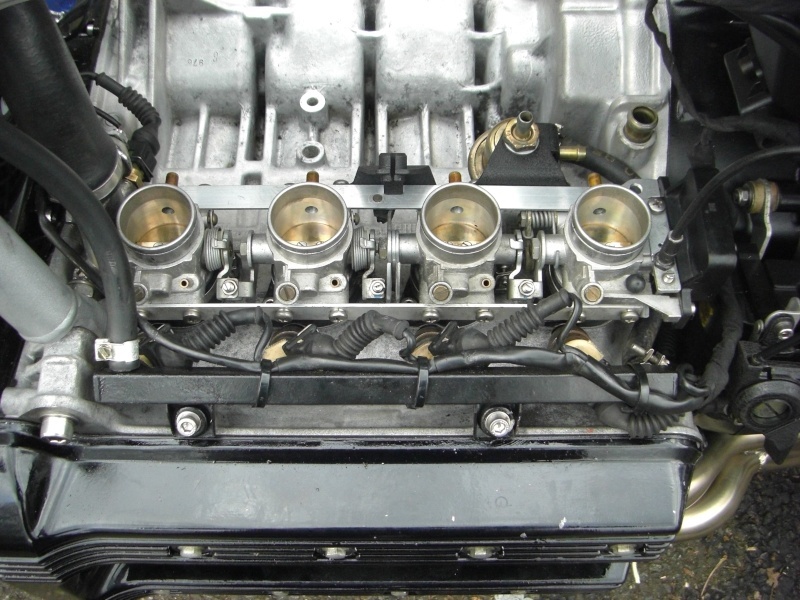 Once the coolant hits a predetermined temperature,say 85 degrees C, the stat will begin to open and if the engine cools it will close slightly. It's self regulating to hopefully keep the engine at an even temperature. I confess I wrote that without thinking you were in the same climate......Sheffield. I was thinking much hotter locations, not a good idea to do without it in the long term. Anyway, the location you have that in makes it a much easier change if it ever needs to be changed. I chose the same temperate range as the stock BMW stat to keep things even so hopefully it won't need to be changed. Thermostats can be interesting. I changed the son in law's on the bmw 540i last week. Unlike his previous bmws it had been generally running cooler, and fluctuating. I found that the thermostat was an 85 degree one. When I put in the 95 one, back to normal - quick warm up and steady in the middle of the temp gauge thereafter. In Oz, it used to be common for people who 'knew' about cars to remove the thermostat from their holdens, Falcons and valiants for more 'cooling efficiency'! Temperatures all over the place, slow warm up and uneven water circulation so the back cylinders of the straight sixes were cooled less. Clever people. 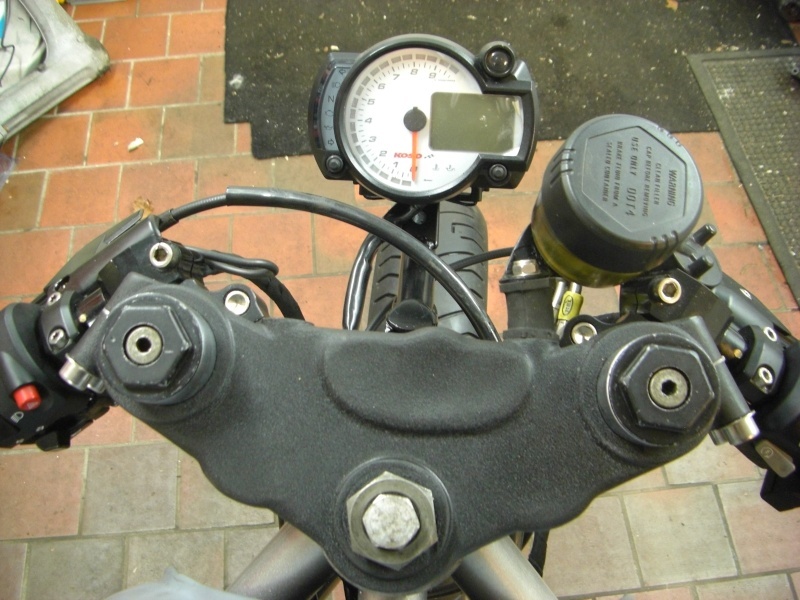 Whilst out riding in a light drizzle yesterday on the K1100RS w/K1200LT motor I would notice the temp gauge dropping to just above the blue lines and only when in town or stopped and idling would the gauge register near to a 'normal' operating range of the other Ks I own or have ridden. Since this bike is relatively unknown to me still, and wiggling/cleaning the sensor wire at the pump did nothing, I'm left to imagine until I rip into it, that the PO removed the Tstat, or it's stuck open. Unless you ride only in Summertime's highest temps at the bottom of Death Valley, Las Vegas, the Pilbara, King's Canyon, perhaps the top end of Chad, and even then, I'm in agreement that running without something stabilising the engine's temperature is folly. 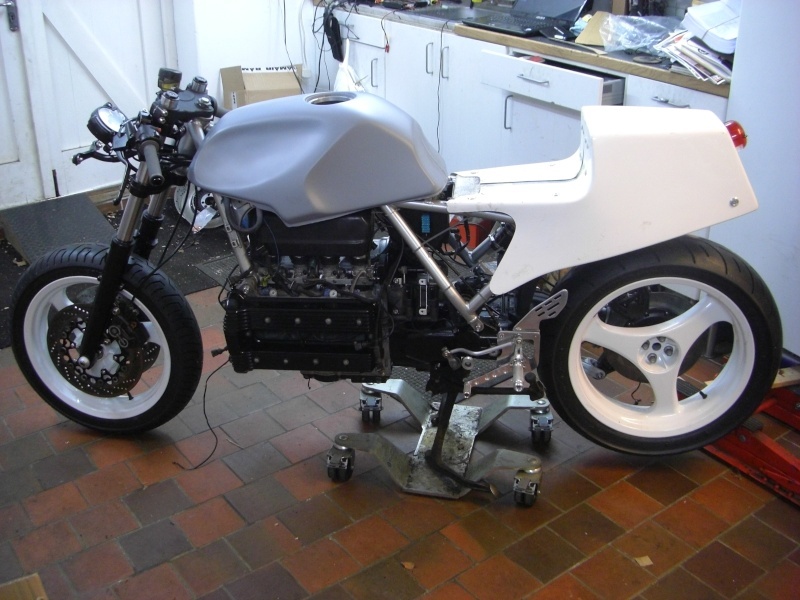 I hope that when all the bodywork is painted the bike looks OK. 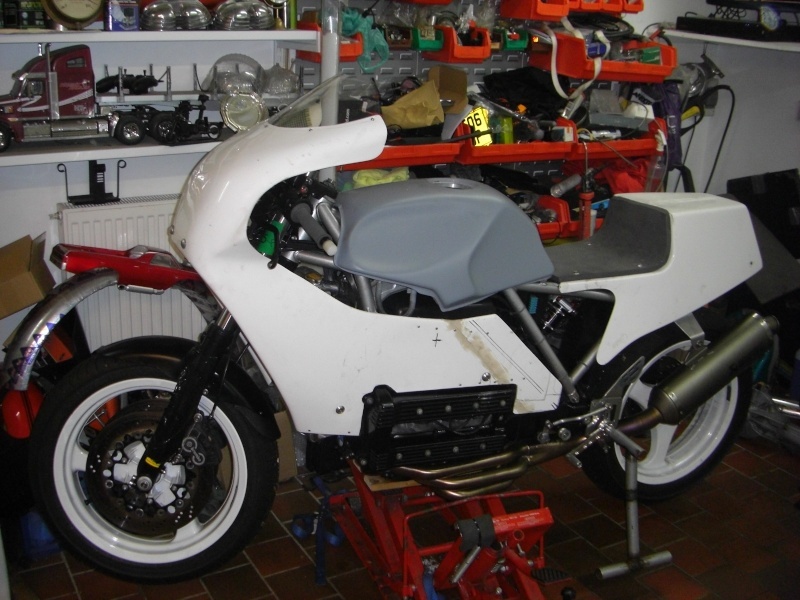 It would seem the chances of getting hold of a Cobas K100 fairing are slim to zero so I'm stuck with this Ducati F1 item. 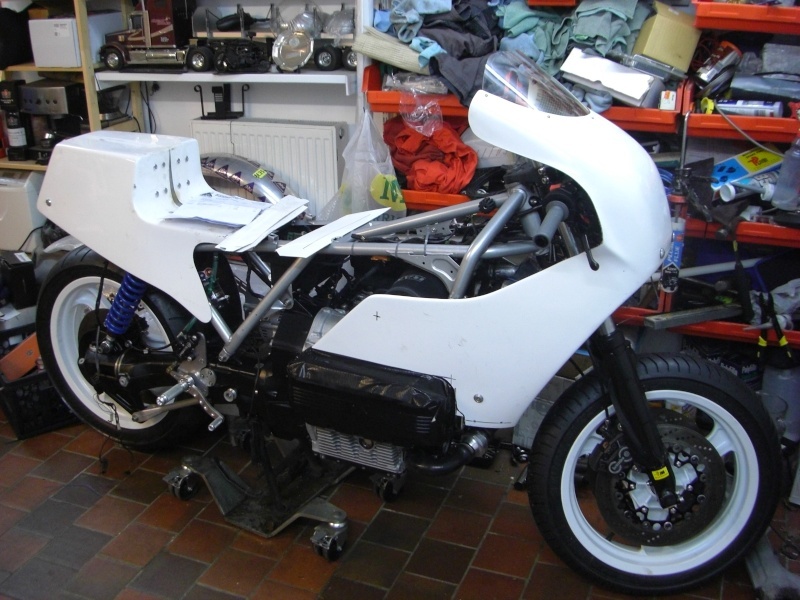 I'll be running the bike with twin lights up front like the Brick endurance racer which i hope will further detract from the fairing not being the shape I want. 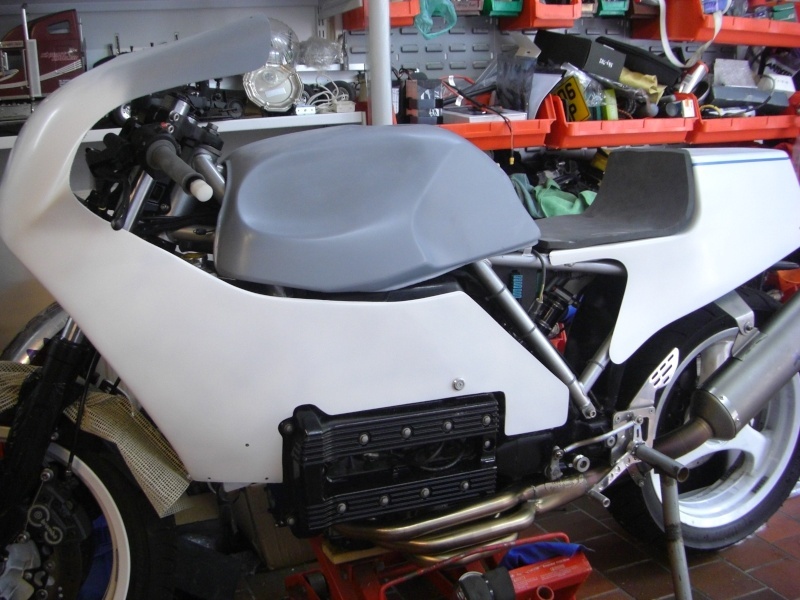 This is the fairing I wanted to use as it's really close to the Cobas bike but it is waaay to small-Shame!! 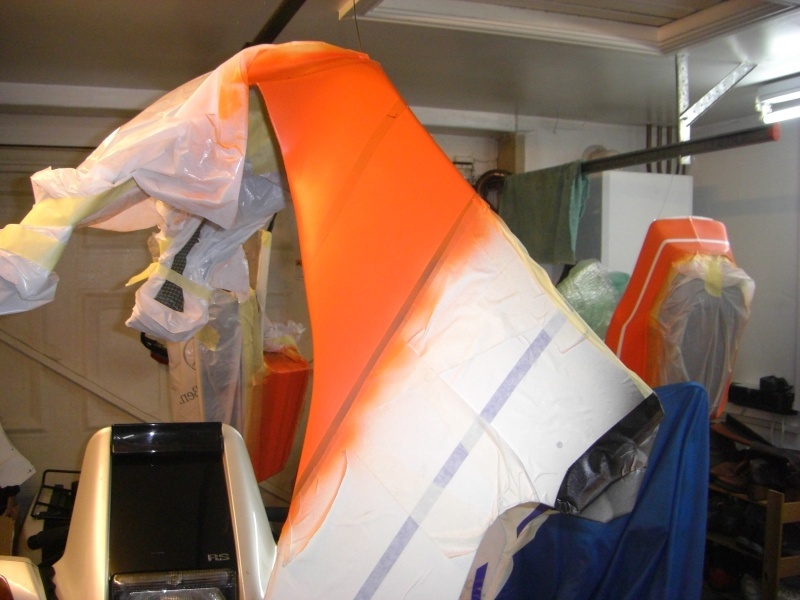 Are you going to try to recreate the same paint job? @Comberjohn wrote: Looking good, Mike. It has to be done in the Cobas colours but that doesn't mean I'm looking forward to executing the paint job. It will be a long process but hopefully rewarding. 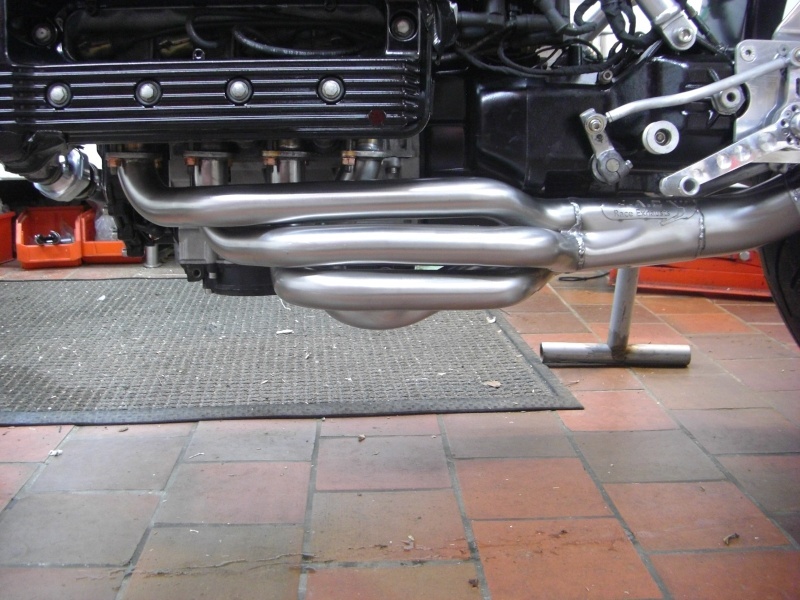 My Exhaust has arrived so it won't be long before I hit the button! 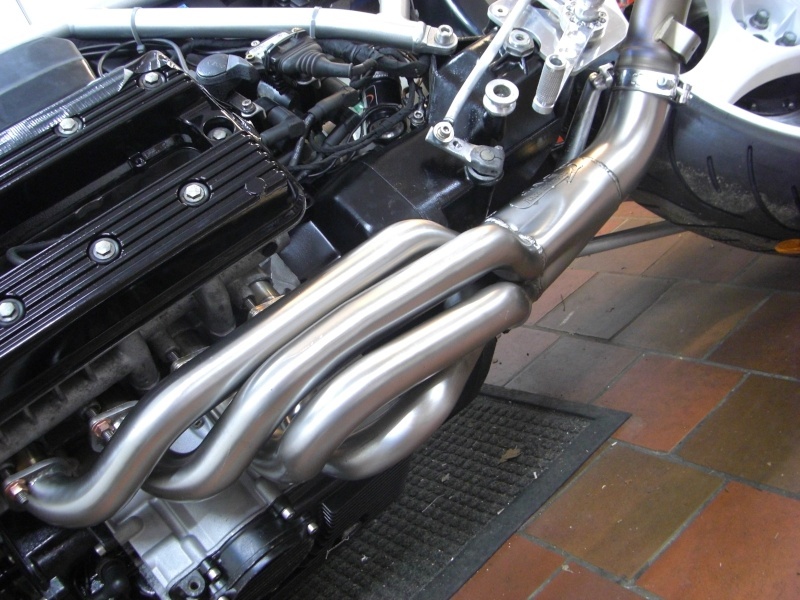 38mm headers with an Akrapovic silencer from an R1200R nicked off eBay for £50-I kid you not!! Back pressure may be an issue and if so, a "kidder" valve will be installed. I need to fabricate a hanger. 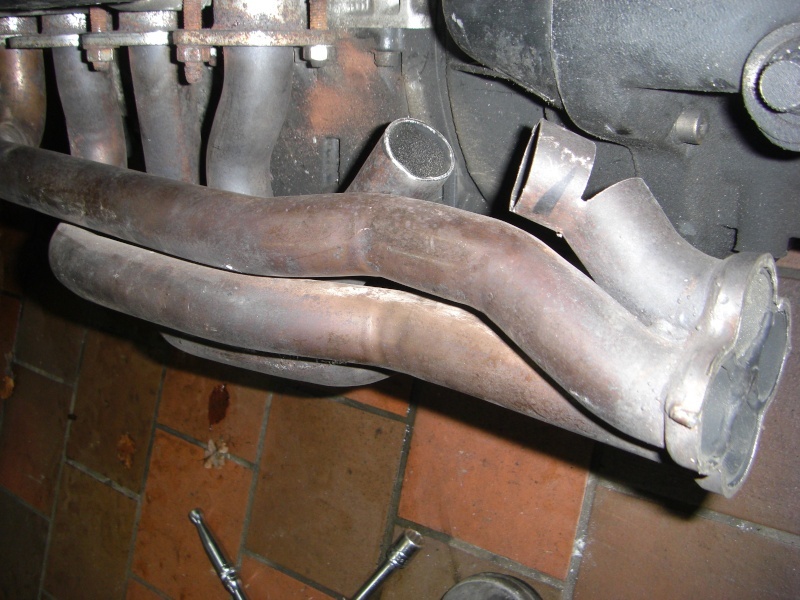 Scared to ask, Mike, but that's a lovely exhaust system. Is it a one of and if it can be bought, how much? It's a one-off. 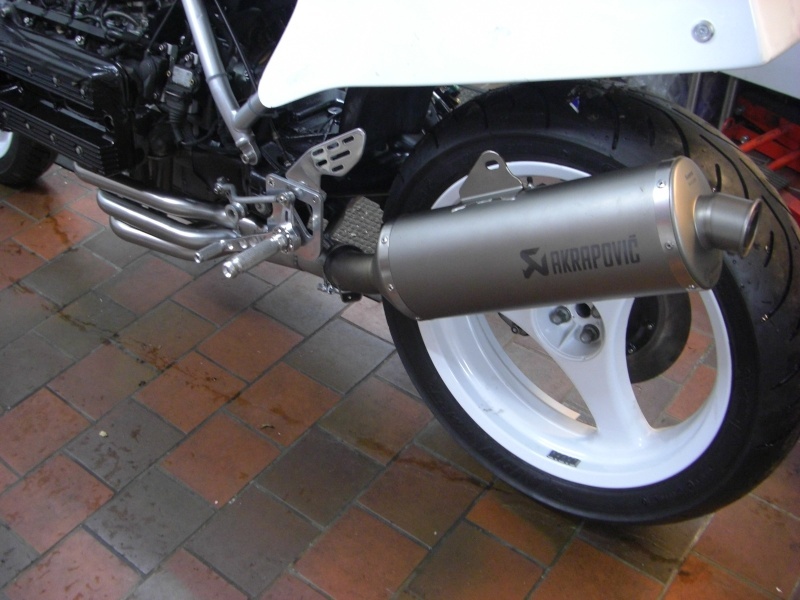 £400 + the R1200R Titanium silencer. Lovely, but ouch. Back to the drawing board (and eBay). 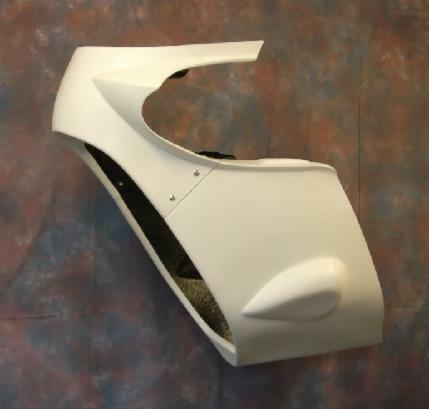 For custom one off headers/collector that looks that nice 400 pounds does not seem that crazy. @Comberjohn wrote: Lovely, but ouch. Back to the drawing board (and eBay). 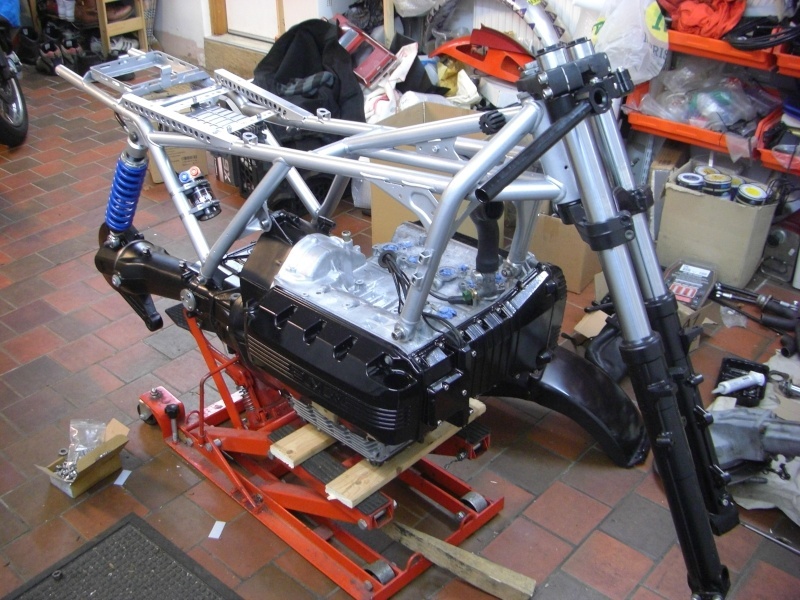 If it's a 1000cc 16 valve model you have,K1200RS/GT headers will fit into the ports but will need huge modifications on #4 pipe to get it around the lump on the bell housing/gearbox. 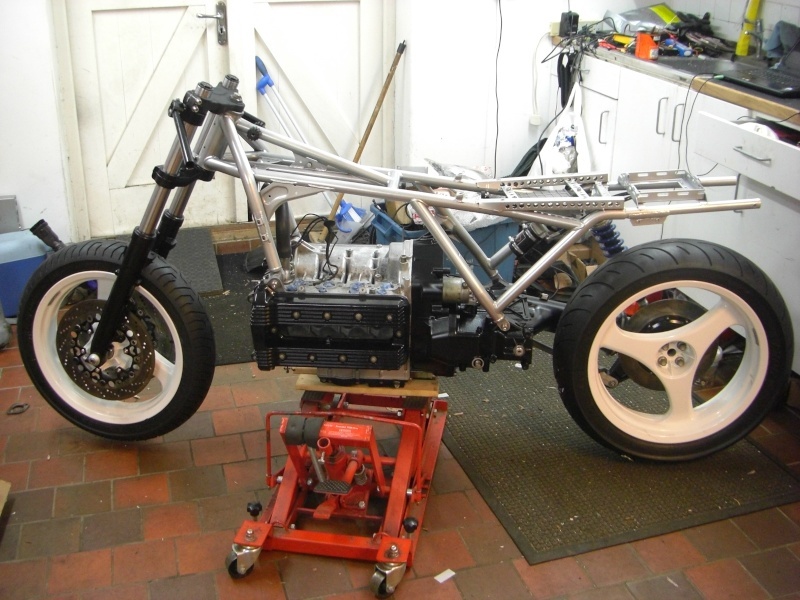 My 8 valve engine was away having work done and I was using a 16 valve motor as a mock up without realising the big differences in the two engines. 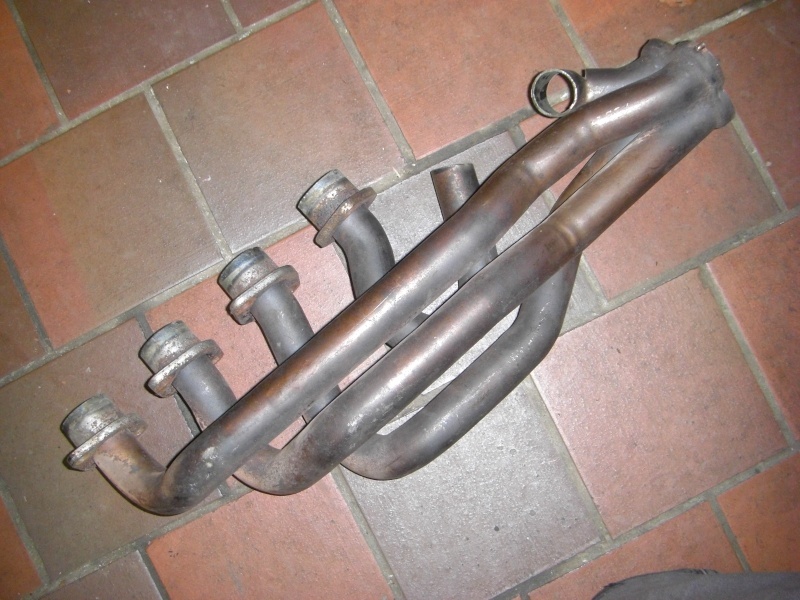 Sadly the 1200 headers will not fit the 8 valve head which is why I cant use them,hence the new pipe set. 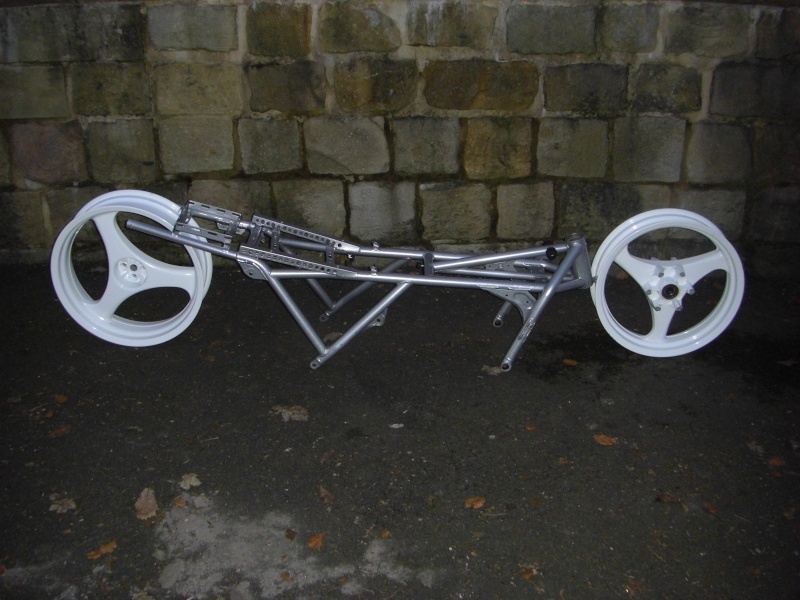 I'll fit these to my 16 valve road bike next winter. I was forced to make a purchase!! It arrived today from Italy in just 4 days. To start the bike I originally bought an Odyssey PC680 for ultra reliability. The trouble is,it weighs 7kg! 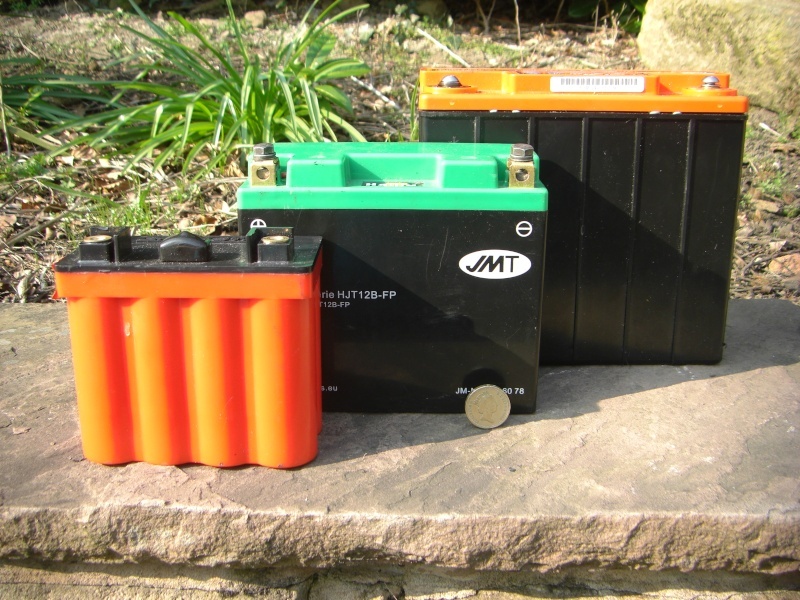 I had a few other batteries in stock so I thought I'd see (just for a laugh) if the small Lithium batteries would start the bike. The coin against the centre battery is a £1 for size comparison. All 3 spun it over without any fuss on multiple start ups. Guess which one I'll use!! 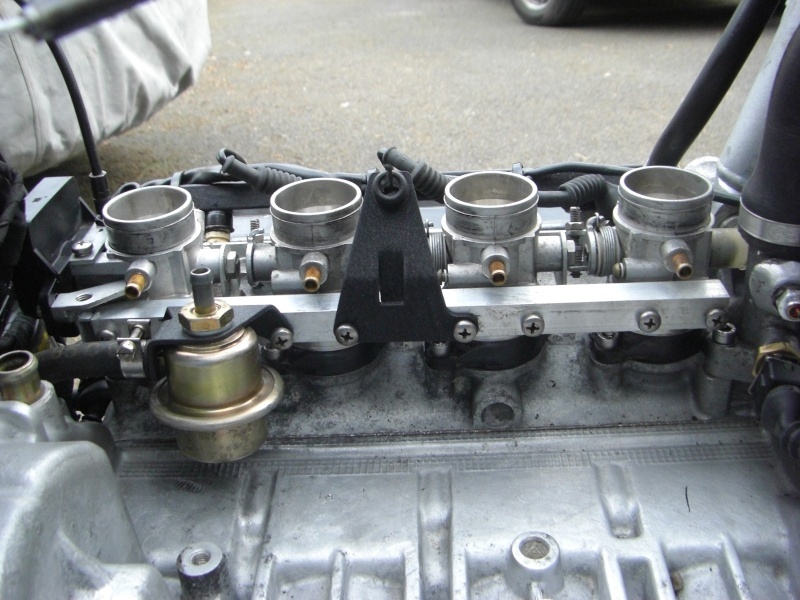 I'm fitting K1100 throttle bodies and I've read elsewhere about the fitment of the cable and fuel pressure regulator. I've used the K100 8v cable post and the 8v FPR bracket. With a small adjustment to the cable post.the cable worked fine and the 1100 FPR fitted the 8v bracket and also fits perfectly. That is the result. No need to change the original cable bracket at the TBs. 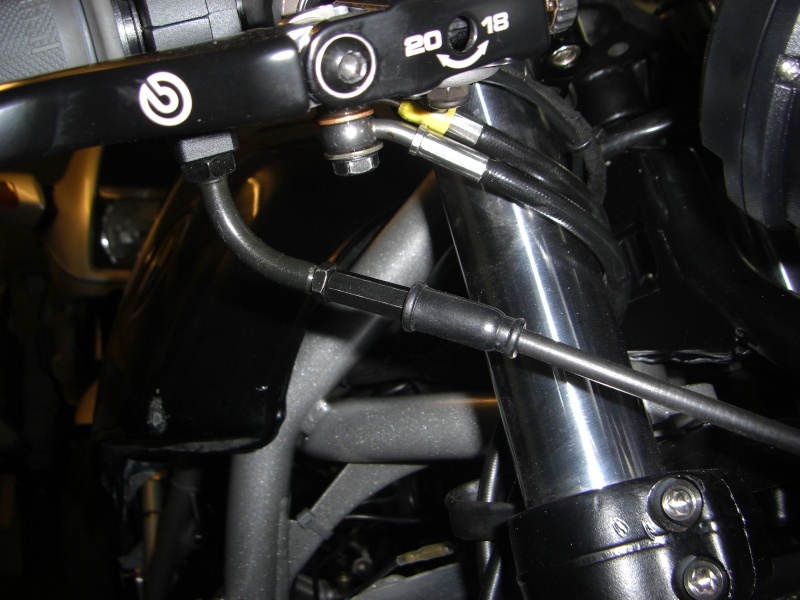 It's only when you replace the twisty grip to a 20mm MC/16V setup that you need to mod the K100 cable end bracket. This is done by grinding a few mm's from the cylindrical end and snipping a few more mm's from the cable's plastic end, then perhaps bending the barcket a smidgen. Results may vary. 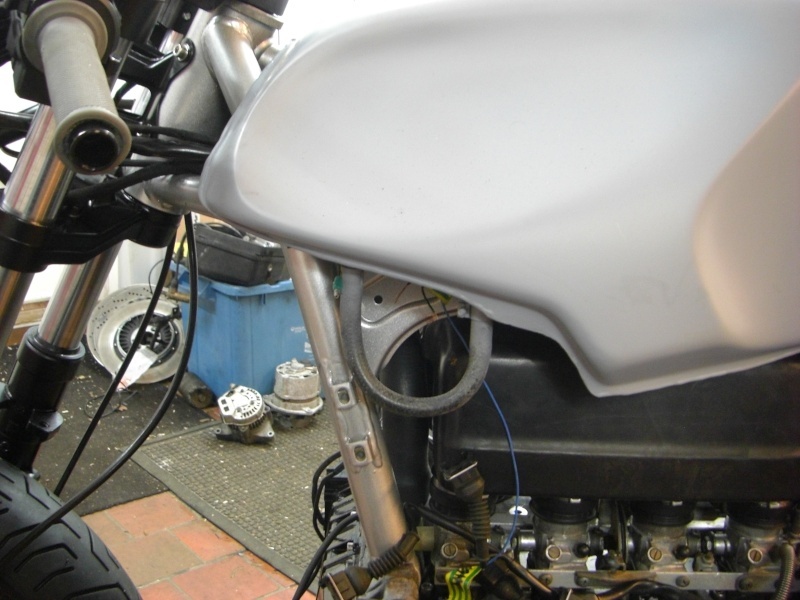 TWB, Motorbike Mike might still need to modify the cable bracket to fit the cable coming from the Brembo radial master he fitted. I'm not sure how the bowden cable looks coming off that twist grip. Of course, it's specifically the other end of the hose that I'm speaking (in)to. 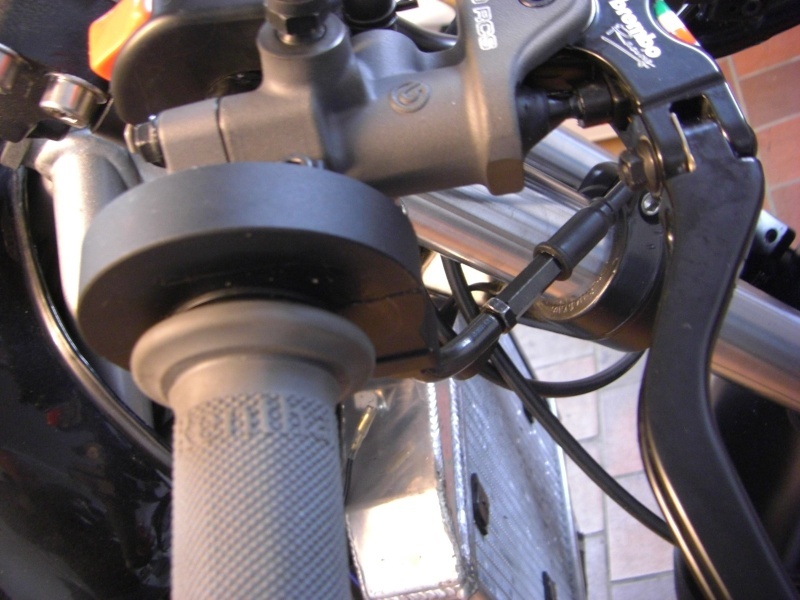 @robmack wrote: TWB, Motorbike Mike might still need to modify the cable bracket to fit the cable coming from the Brembo radial master he fitted. I'm not sure how the bowden cable looks coming off that twist grip. The twist grip end is all good. I did expect to have to modify the cable at the TB end and must admit that it's on it's tightest limit but free play is still present so it's signed off the list. I make all my own control cables so an alteration is never an issue. I've tried to show the twist grip and cable below. I find the tanks on the K's big and bulbous so modifications had to be made. 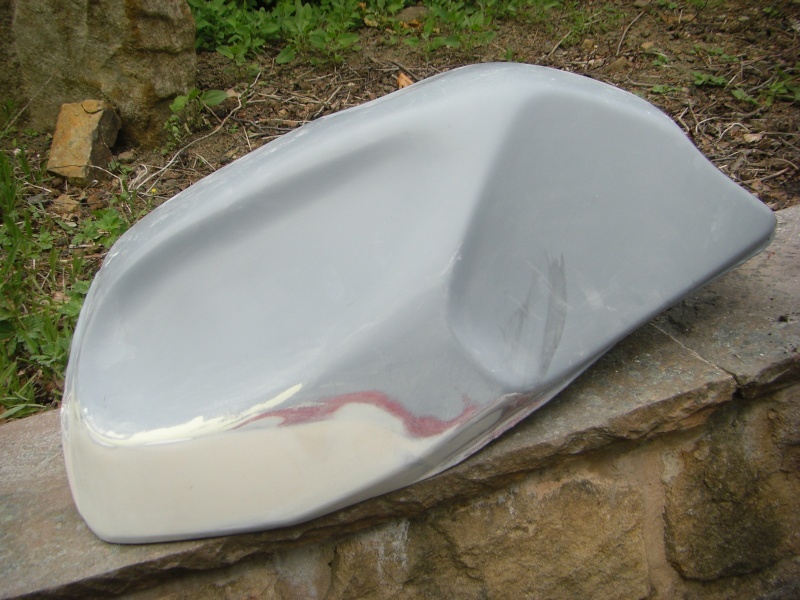 When the tank was sat on the bike (see first image),the shape at the front looked unfinished and a poor effort,like they all do in my opinion. 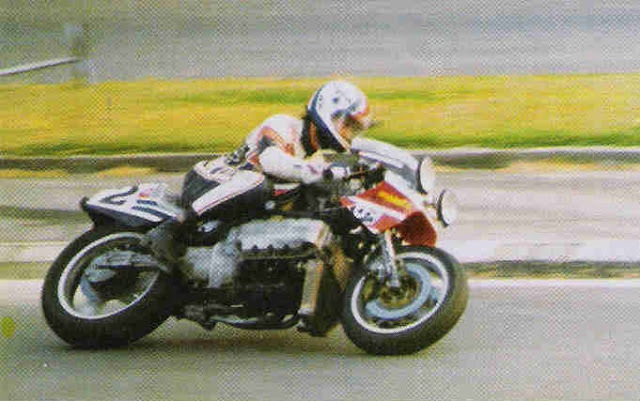 Why does every modified K100 have the petrol tank ignored? It's a focal point of the bike,I just don't get it. Just for you Sir,the filler-primer is still wet! Looks great,it sure look less bulky,did you use a software mallet and a sand bag to make the 'dents'on Both sides. @k-rider wrote: Looks great,it sure look less bulky,did you use a software mallet and a sand bag to make the 'dents'on Both sides. I used a hide mallet because it's all I could find. Is there still Room for removing/installing the fuel pump? I must admit that when I started modifying the tank,I just got stuck in with the mallet with no consideration for the internals of tank. If you look inside where the pump sits,it fixes into it's own bracket. 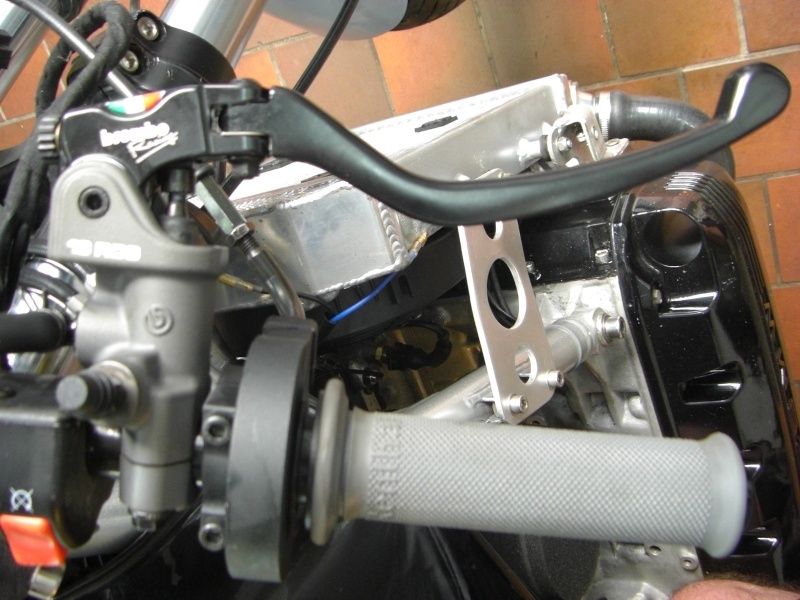 The rear of the scallop goes right in front of the pump bracket. I have to admit that it's luck rather than judgement that the pump location is unaffected but every now and then,something works out OK.
Hi Mike. Do you have any panel beating skills or was it easier than you imagined? I keep thinking of the Father Ted episode where he tried to beat out a dent on the raffle car and didn't know when to stop. Might be worth keeping an eye on eBay for a spare tank before I would start! 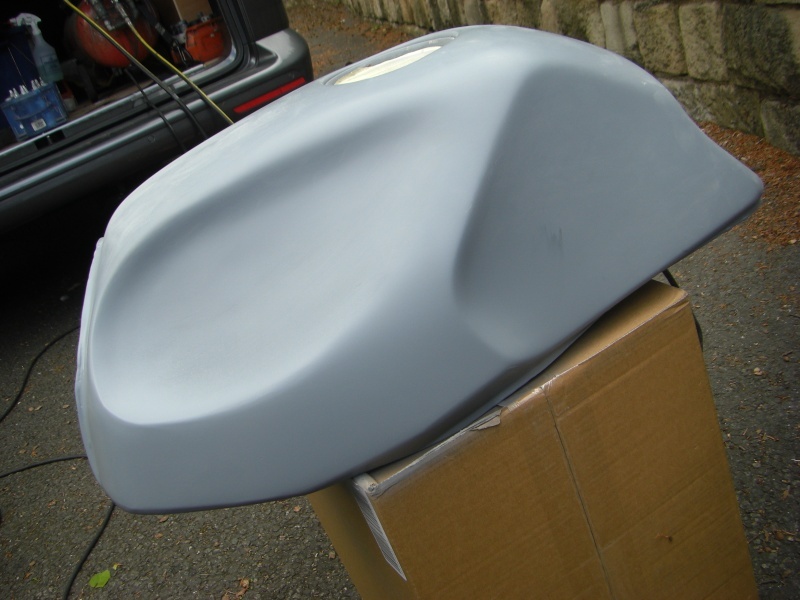 I had a couple of tanks and just thought I'd try some "adjustments" I think it's a common sense thing,just go steady and even-there's always body filler if you go too far! and a new dash from Translogic.